If you are traveling across Ecuador, you shouldn't miss along the way city of Riobamba. The city is the capital of Chimborazo Province located in central Ecuador, and although Riobamba doesn't offer that much in terms of history and architecture (in comparison with Quito or Cuenca), this deficit is compensated when it comes to culture, and natural beauty. The significant community of indigenous people living in the city and in near surrounding still wear their layered dress and work in traditional industries. Also, visitors can explore the beautiful volcanic landscape outside the city's boundaries. CHIMBORAZO: THE HIGHEST MOUNTAIN IN THE WORLD? Riobamba is biking, hiking and climbing capital of Ecuador, and in its proximity, you can find several peaks and volcanos which attract visitors from all around the world. While Chimborazo is the highest mountain which receives the attention in particular, there are other snow-capped volcanic peaks such as Carihuairazo, Sangay, El Altar and the most active one, Tungurahua. When we were arriving in the city or when we were only leisurely strolling around Riobamba, we couldn't believe our own eyes how many volcanos we could see at once. There is one fun fact associated with Chimborazo mountain. Did you know, that Chimborazo is the highest mountain in the world? How is it possible? Yes, Mount Everest is 8848 meters high while Chimborazo lies 'only' 6263 meters above sea level, but - the peak of Chimborazo is the closest point to the sun from the center of the Earth (its location is along the equatorial bulge) - from this point of view, Chimborazo beats Mount Everest by 2 kilometers. Chimborazo mountain is heaven on Earth for all who love mountains and for those who like to spend their time actively. There are several ways how to enjoy Chimborazo National Park and how to be in proximity to this Ecuadorian giant - it only depends on your preferences. Drive | There is an asphalt road from Riobamba to the borders of the national park, and here it changes into a dirt road which will take you to Refugio Carrel in 4850 meters above sea level. If you feel that physical activity at this altitude is not for you, that's a good compromise. From Riobamba, take the scenic route to the refuge. Along the way, you can admire stunning views of Chimborazo and also wild vicunas. We believe that if you spend only a short time at the altitude, you should be fine. Hiking | One-day hiking or multiday trekking is an option for those who want to spend some time and stretch legs in Chimborazo National Park. You can either walk from Refugio Carrel to Refugio Whymper at 5060 meters and from here carry on a bit further to Laguna Condor Cocha (it takes about an hour and a half return), or if you prefer having panoramic views of Chimborazo rather than walk on its slopes, you can opt for a multi-day hike which goes around. Always check if it is necessary to have a guide. Climbing | Who wouldn't want to conquer the summit of the highest mountain of Ecuador? Well, admittedly this activity is not for everyone, but only for well-trained mountain climbers or at least those, who have some experience with mountain climbing and those with an excellent physical condition. The summit of Chimborazo lies at 6263 meters, and the climb can be done in two days assuming that you are well-acclimatized. If not, add a couple of days. Biking | No, we don't think you should bike all the way up, although it would be a challenging exercise for those who like to push their limits and it is for sure possible. Biking all the way down sounds much more exciting, right? Also, when we read about all the activities which were possible to do in Chimborazo National Park, biking its slopes down was the one which immediately caught our eyes. It was at the end also what we did. Here we share our experience of biking down the Chimborazo. It doesn't matter if you visit Ecuador on long-term travel trip or during a few weeks long vacations. If you are not on a specialized biking trip, we assume that you don't have your bike with you. Nor we did. The easiest way how to solve this problem is to book a tour in Riobamba - you will get all the equipment plus you don't need to worry about how to get to Chimborazo National Park. In Riobamba, you will find several travel agencies, but only a few of them are specialized on biking tours. After thorough research, we have chosen to do the trip with Julio Verne Travel. There were several reasons why we chose this company, but the most significant one was that Julio Verne Travel operates for more than 23 years - it is not that common to find a small company with such a long history in tourism, especially in Ecuador - and also the company offers more tours than only this one, so we believed they would be well-experienced. The tour started in Riobamba. Our guide who was also driving a car picked us up in front of the office. We jumped on a minivan as we had approximately an hour in the car ahead of us to get to Chimborazo National Park. The drive up is scenic as the road goes through the picturesque landscape of the Andean highlands. We could stop along the way as much as we wanted and take pictures of Chimborazo (which was without clouds in the morning, but then dark clouds from the other side of the valley started to roll over) and wild vicunas on the pastures around. Vicunas, wild relatives of lamas, are very shy, so try not to scare them. In about 4400 meters we turned right from the main road to the dirt one, where also our guide had to check us in the park. Then we carried on to the parking lot at the Refugio Carrel at 4850 meters. It is always good to be well-acclimatized or at least know what to expect in an altitude of about 5000 meters. From our experience, we usually don't feel the altitude much when we are that high only for a couple of hours. We returned from the Galapagos Islands only one week before biking down the Chimborazo (meanwhile we spent some time about 3000 meters high) and we felt just fine. It is necessary to say that during this tour you will be in the high altitude only for about two hours and then you will start biking down, so hopefully, everything should be alright. If not, tell the guide immediately. This biking tour includes a combination with a short hike (it is up to you if you want to go up or not though). We walked up to Refugio Whymper at 5060 meters, and from here we carried on a bit further to Laguna Condor Cocha at 5100 meters. The trail is easy to follow, and it leads all the way up on a nice stony-dirt path. We walked slowly but still reached the lagoon in about 40 minutes. Here we stayed for a while, took some photos and observed how the summit of Chimborazo disappears in the cloud. When we came back to the parking lot, we quickly put on all protectors, Dimitri meanwhile prepared bikes for us and we could start the downhill mountain bike ride. And what a ride it was! From the start (4850m) to the finish (in 3100 meters) you don't need to (almost) pedal. First 9 km led on the dirt zig-zag road with impressive views of the hilly and barren (almost moon-like) landscape, while the base of Chimborazo was looming behind us. Also, it was cool to see Martin as a tiny point in front of me disappearing in the dust. When we reached a checkpoint, we turned left and rode the rest of the 29 km on an asphalted road with very little traffic to the village of San Juan. In this section, we could watch the landscape changes as everything turned greener while we were descending. Along the way down, we took many stops to take photos or only to have a rest from braking. In San Juan, we stopped in the restaurant for lunch (included in the price), and after lunch, we headed back to Riobamba. The whole trip can take 5 - 7 hours, it depends if you want to hike to the second refuge and also how fast you will be while biking on the way down. There is no need to hurry as the purpose of this trip is to enjoy the spectacular views and the ride itself than to race. The first thing we had to do in the morning, right after we arrived in the office, was to try bikes and other equipment - helmets, gloves, knee, and elbow pads and balaclavas. What we checked first were brakes as we knew we would use them a lot that day. There was a lot of equipment in the office as the agency apart from biking also do climbing, multi-day trekking or Amazon tours. Everything looks pretty new and in good shape that for a moment we had a feeling we are in a sports shop rather than in the travel agent's office with rental equipment. It was only two us for the tour that day, probably because we arrived in Riobamba at the beginning of October, which is mid-season in Ecuador, so we truly received personalized service. All guides are Ecuadorians (although the company is Dutch-owned) and must be certified and specialized for each activity. We can only evaluate our guide, Dimitri who spoke well English, was communicative and knowledgeable about the area of Chimborazo. He also followed us all the way down in the car in case something would have happened or in case of mechanical issues. We've never done a tour similar to this one, a combination of a short hike and then biking. Also, we've never done such an effortless bike riding as going downhill from Chimborazo. The only demanding factor is the altitude, otherwise, we believe that everyone can make it. What we liked the most was that this day wasn't only about enjoying nice views (even though it was still the number one reason why we wanted to visit Chimborazo National Park), but it was also actively spent day (something we sometimes miss when traveling from place to place), and moreover, it was fun! We also appreciated the service we received - it was professional and smooth. 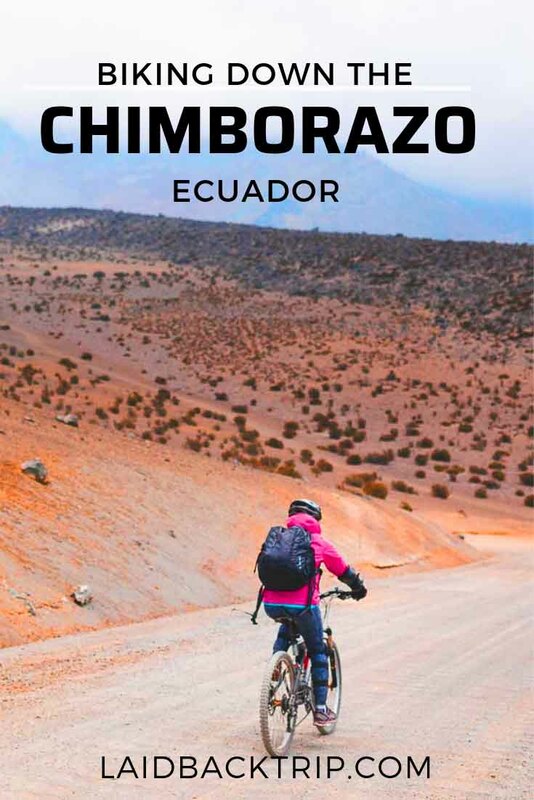 What do you think: is biking in Chimborazo National Park something you would like to try when in Ecuador? Planning to stay in Riobamba and looking for an accommodation? We stayed in the hotel Hotel Santa Isabella, or you can check availability in other hotels in Riobamba HERE. You can also read our full Mansion Santa Isabella review. For the information about tours, you can check the Julio Verne Travel website. To contact the office, click on the contact form. This post was written in collaboration with Julio Verne Travel. As always, all opinions are our own.